Note: If you purchase anything from links in this email, I may receive a small affiliate commission at no additional cost to you. I only mention products I love and would recommend whether I was being compensated or not. Thank you for your support. The older I get, the more I think that little things matter. I’m a details person. If you’ve been following Glimsen, you know this. I like to zoom in on the details, both in words and in photos. I’m an observer. Sometimes I see things that other people miss. This love of details shows up in my everyday in the form of beauty, color, and even comfort. These details of my day—the little things—add up to make the ordinary special. In the spring, we stayed with some friends on St. Simons Island for a couple of days. We wanted to explore the island, but the forecast called for a day-long downpour. Our lovely host, Debbie, loaned me her rain boots. She didn’t know that I have always, ever since I was a little girl, wanted a pair of rain boots. I remember reading picture books that showed children wearing “galoshes” and rain coats on bitterly cold days. But, in the South, our rain is usually accompanied by hot weather and humidity, so the idea of wearing boots that would make me hotter kept the grown-up me from buying a pair. But when Debbie offered me hers on that cool and wet spring day, I gladly borrowed them and stayed dry, even in driving rain that left puddles in parking lots. And her boots were so cute. I promptly ordered some of my own. 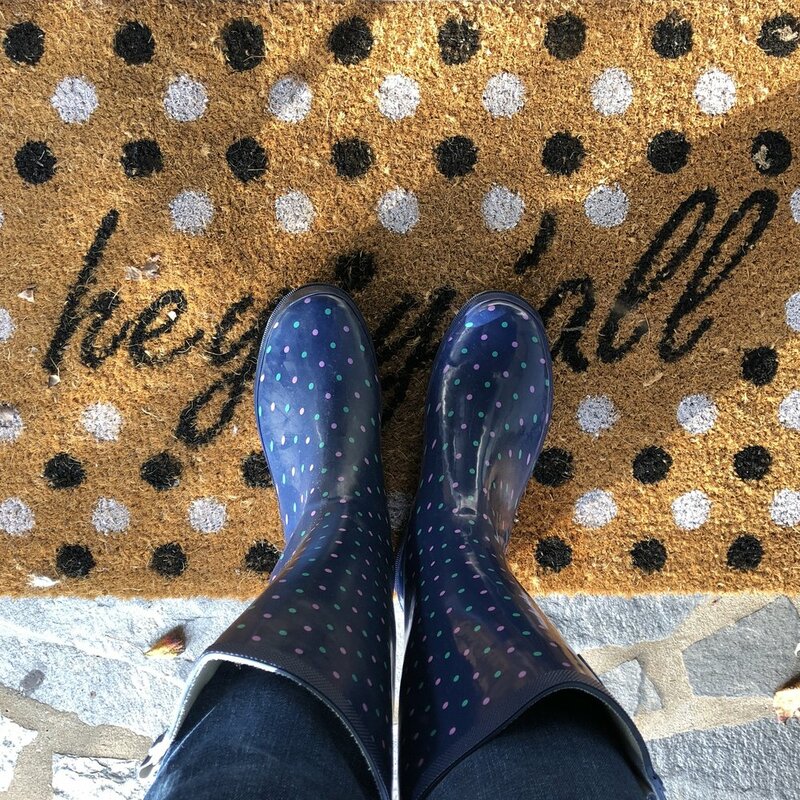 We have had record rainfalls at home this week, so I have worn my boots every day. It’s a little thing, but it makes me happy. Also in the “I’ve always wanted one of those” category: a leather backpack. Years ago when I was in college, my good friend Lee finished her masters degree, and her husband, Dave, bought her a beautiful, black, leather backpack to celebrate. She doesn’t know this, but ever since then, I’ve wanted one too. I was newly married at the time, and my husband and I were saving for a house, so I didn’t even put it on my wish list. Through the years at random times, I’ve asked myself if I would use a leather backpack enough to warrant the expense. Recently, I confessed this desire to my loved ones, and they encouraged me to get one. On vacation I saw it: a slim style perfect for my laptop, planner, and a few other things. I chose teal because it’s such an unusual color and it keeps showing up in unexpected places in my life (see rain boots above). I use it several times a week, and whenever I see it in my office or beside the sofa, I smile. It’s another detail in my life that adds color and pleasure. Last summer, on vacation in Savannah, we walked early every morning in “our” neighborhood—where our rental was. On the next street over is a restaurant and bar called Collins Quarter. One morning we stopped in and ordered an espresso for Mart and a pot of tea for me. Having grown up drinking my tea with ice, I was just developing a taste for hot tea, and the pot of Harney and Sons English Breakfast served by a friendly and knowledgeable barista named Patrick absolutely won me over. I came home, ordered my own 2-cup tea pot and English breakfast tea, pulled my china out of the cabinet, and started having tea every morning. I eat a little breakfast, read posts from favorite bloggers, and drink my tea. My morning ritual makes even email special. Now that the weather has finally turned cold here, I have pulled my gloves out of storage and stuffed them into my coat pockets. Several years ago, I found a pair of velvet gloves that are softer than soft and warmer than warm. But the best thing? They’re purple. Yes, purple. (see above) They are my favorite accessory of all time. They always garner compliments from other detail people. Last year, I bought a pair of dark red velvet gloves by the same brand, Cejon, and I like them too, but they cannot supplant my deep and abiding affection for the purple ones. Other little things I love are these pens (the purple and blue! ), this candle (smells like winter to me), this lotion (fresh and not overpowering) and this vest (in teal of course). All of these everyday favorites bring beauty, color, and comfort to my life. They make it better. So maybe they aren’t so little after all. What little things make you happy? What details in your life are you loving right now? I’d love to know! Leave me a comment or send me an email at leannebenfieldmartin@glimsen.net. If you’d like to receive my blog posts about the beauty around us, just sign up below and get a free beauty quote to print out and enjoy.